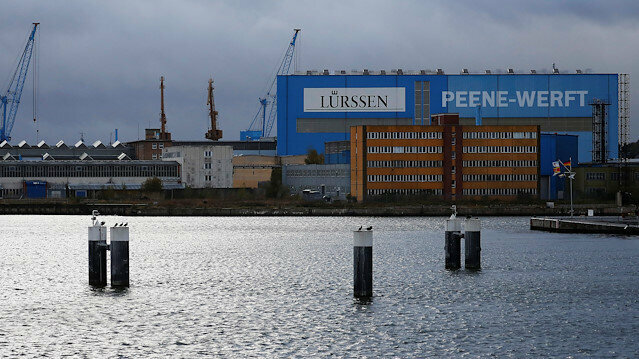 The Luerssen Peene shipyard is pictured in Wolgast, Germany, October 23, 2018. German shipbuilder Luerssen has suspended production of coastguard vessels it was building for Saudi Arabia and placed large numbers of staff on short hours, blaming uncertainty over whether Berlin would grant future weapons export licences. After dissident journalist Jamal Khashoggi was killed in Saudi Arabia's consulate in Istanbul, Chancellor Angela Merkel said Berlin would authorise no further weapons exports until Riyadh had satisfactorily explained his death. Privately-owned Luerssen was commissioned to build the coastal patrol vessels five years ago, and construction began at its Peene Shipyard in 2016. "Suspending construction and cutting working hours as a direct consequence is a heavy blow to us," said shipyard official Harald Jaekel in a statement. Almost all of Peene's 300 workers would be affected, the statement said. The uncertainty over future authorisations made production planning impossible, the company added, saying that suspending production was the only way to minimise the resulting risk. Saudi Arabia makes a major contribution to Germany's defence industry. So far this year, some 400 million euros of exports were approved to the country, making it the second-biggest recipient of German arms after Algeria. Riyadh at first denied that Khashoggi was dead, before finally conceding under heavy international pressure that he had in fact been killed by Saudi agents.